3. Subject to the clauses below, entry is open to NSW, QLD, VIC and SA residents of Australia who have fulfilled the requirements set out below ('Eligible Entrants'). Entrants must be over the age of 18, as of the date of entry. 4. Employees, and their immediate families, of the Promoter, associated agencies and companies, contractors or individuals are not eligible to enter this competition. Immediate family means any of the following: spouse, ex-spouse, defacto spouse, child or step child (whether natural or by adoption), parent, step parent, grandparent, step grandparent, uncle, aunt, niece, nephew, brother, sister, step brother, step sister or 1st cousin. 5. The Promoter is Trip A Deal Pty Ltd (ABN 50 149 240 433) (the 'Promoter'). The Promoter's address is 15 Wollongbar Street, Byron Bay, NSW 2481. 6. 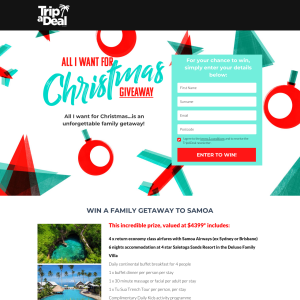 To enter Eligible Entrants must, during the Promotional Period (defined below): enter their email address in our database at www.tripadeal.com.au. 8. Entries must provide contact details on request to be eligible to win. Entrants may only enter in their own name. Inaudible, incomprehensible, illegible, and incomplete entries may be deemed invalid. 9. Only one entry per person will be permitted. Entrants found to be submitting multiple entries may have all entries invalidated. 10. The competition commences on 04/12/2018 at 10:00 AM and closes 19/12/2018 at 10:00 AM ('Promotional Period'). All times noted in these Terms and Conditions are local times, based on the location of the Promoter. If any draw date falls on a public holiday, as defined in the state of the Promoter, that draw will be conducted on the next business day. Entries must be received by the Promoter prior to the competition close date and time. 11. The winner will be the first valid entry drawn at Promoter's Premises at 15 Wollongbar Street, Byron Bay, NSW 2481 on 19/12/2018 at 3:00 PM. The Promoter will ensure that all entries have an equal chance of winning a prize. 12. The winner will be notified by email within two business days of the draw. Their name will also be published on 20/12/2018 at tripadeal.com.au for 28 days. 13. Prizes (or in the case of vouchers, prize confirmations) will be sent within 28 days of the draw. 14. The Promoter may conduct such further draws on 07/01/2019 (at 11:00 at Promoter's Premises at 15 Wollongbar Street, Byron Bay, NSW 2481) as the original draw in order to distribute any prizes unclaimed by this date, subject to State and Territory legislation. Winners of any further draws will be notified by email within two business days of the draw. Their names will also be published on 09/01/2019 at tripadeal.com.au for 28 days. 15. The total prize pool is valued at up to $4,399 (Including GST), as at 04/12/2018. Sydney: April: 4, May: 16, August: 3, 10, 17, 24, 31, September: 7, November: 9, 16 or December 5. This prize is for 2 adults and 2 children. Children are classified as 11 years or younger. 17. Unless expressly stated in these Terms and Conditions all other expenses are the responsibility of the winners (and their companions) including but not limited to current passports, visas, meals, spending money, transport to and from departure and arrival points, transfers, drinks, incidentals, mini-bar, laundry, room service, telephone calls, activities, gratuities, services charges, travel insurance, pre and post accommodation, optional activities or excursions and all other ancillary costs. A credit card imprint or cash deposit may be required from the winner at check-in to the hotel, for all incidental charges. Holidays are subject to flight and booking availabilities. 18. By entering this competition, and by collecting a prize, the winner acknowledges and accepts that driving, travel and any other activities comprising the prize, are inherently dangerous and may result in death, injury, incapacity, damage to property or other losses. The Promoter is not responsible for any acts of god, such as adverse weather conditions or industrial action or civil commotion that may occur whilst the winner is travelling. It is the responsibility of the prize-winner to enquire about local issues and conditions at destinations prior to travel. Winner will be required to sign Indemnity as a condition of acceptance of Prize. The Promoter does not guarantee that the winner will enjoy the travel prize or be suited to the type of travel prize that is offered. 19. Travel arrangements to and from the winner's home and their nearest capital city airport do not form part of the prize unless expressly stated in these terms & conditions and are the responsibility of the winner and their travelling companion/s. The winner must travel on the same flights and itinerary as their travelling companions. The travel prize cannot be used as part payment for another airfare package. Frequent flyer points cannot be accrued on this prize. Flights and accommodation are subject to availability at the time of booking and cannot be exchanged for other destinations. Travel restrictions & blackout dates apply. Prizes cannot be taken during peak periods or school holidays, and winners must provide all suppliers with a minimum of 21 days' advance notice of intention to travel. Embargo restrictions apply during certain periods. Bookings are subject to conditions & availability (including but not limited to capacity limitations and other restrictions). 21. Compliance with any health or other government requirements is the responsibility of the prize winner and their travel companions. All prize travel will be subject to the carrier's General Conditions of Carriage. The Promoter and carrier make no representation as to the safety, conditions or other issues that may exist at any destination. International travel advice can be obtained from various sources, including local government, local consular offices and the web site of the Australian Department of Foreign Affairs and Trade at www.smartraveller.gov.au. Prizes for travel for a particular event or attraction must be taken to coincide with the event or the times and dates during which the attraction is available. Travel insurance is not included in the prize but is highly recommended. 23. Any entrant found to be entering incorrect contact details, including incorrect email contact details, will have all entries invalidated and any claim to any prize will be invalidated. If such an entrant is awarded a prize and then found to have breached this clause, the entrant must immediately return any prize awarded. The Promoter has sole discretion to determine if this clause has been breached by any entrant. The Promoter reserves the right to request whatever documentation it deems necessary to confirm if the entrant has breached this clause. An entrant must provide any requested documentation to the Promoter upon request. 24. If the prize is unavailable, for whatever reason, the Promoter reserves the right to substitute the prize for a prize of equal or greater value, subject to State and Territory legislation. Cash will not necessarily be awarded as a substitute. It is a condition of accepting the prize that the winner must comply with all the conditions of use of the prize and prize supplier's requirements. Each prize must be taken as stated and no compensation will be payable if a winner is unable to use the prize as stated. 25. The Promoter highly recommends a current residential street address be provided when requested for ease of correspondence and potential prize delivery. The Promoter makes all reasonable efforts to deliver prizes to the addresses provided by competition entrants. The Promoter cannot guarantee that any prizes returned to the Promoter due to non-delivery at the provided address will be re-sent to the prize winner. 26. The Promoter reserves the right to request winners to sign a winner's deed of release (and indemnification) or any other relevant forms or agreements that the Promoter deems necessary, to provide proof of identity, proof of age, proof of residency at the nominated prize delivery address and/or proof of entry validity (including phone bill) in order to claim a prize. Proof of identification, residency, age and entry considered suitable for verification is at the discretion of the Promoter. In the event that a winner cannot provide suitable proof, the winner will forfeit the prize in whole and no substitute will be offered. 27. The Promoter reserves the right to conduct a redraw in the event that an entrant, claiming to be a winner, is unable to satisfy these Terms and Conditions or has breached these Terms and Conditions. 28. The Promoter's decision in relation to any aspect of the competition is subject to State and Territory legislation but also final and binding on each person who enters. No correspondence will be entered into. No responsibility is accepted for late, lost or misdirected entries. Prizes are subject to availability, not transferable or exchangeable and, with the exception of cash prizes, cannot be taken as cash. Prizes will be sent to the winner's nominated address as stated in their original entry. The Promoter and their associated agencies, and companies associated with this promotion will take no responsibility for prizes damaged or lost in transit. 29. By submitting an entry into this competition entrants consent to receive promotional and other marketing messages from the Promoter (including messages sent electronically for an unlimited period of time). Entrants will be able to opt-out at any time by following the instructions included in each message sent by the Promoter. 31. All entries and any copyright subsisting in the entries become and remain the property of the Promoter who may publish or cause to be published any of the entries received. 32. In participating in the prizes, the winners agree to participate and co-operate as required in all editorial activities relating to the Competition, including but not limited to being interviewed and photographed. The winners (and their companions) agree to granting the Promoter a perpetual and non-exclusive licence to use such footage and photographs in all media worldwide, including online social networking sites, and the winners (and their companions) will not be entitled to any fee for such use. 33. Prize-winners are advised that tax implications may arise from their prize winnings and they should seek independent financial advice prior to acceptance of that prize. 34. The Promoter (subject to State and Territory legislation) reserves the right to amend, cancel or suspend this competition if an event beyond the control of the Promoter corrupts or affect the administration security, fairness, integrity or proper conduct of this competition. The Promoter will disqualify any individual who has tampered with the entry process or any other aspect of this competition. In particular, computer generated entries and the use "scripting" is not permitted and will not be accepted. 35. Any cost associated with accessing the promotional website is the entrant's responsibility and is dependent on the Internet service provider used. 36. Nothing in these Terms and Conditions limit, exclude or modify or purports to limit, exclude or modify the statutory consumer guarantees as provided under the Competition and Consumer Act 2010 (Cth), as well as any other implied warranties under the ASIC Act or similar consumer protection laws in the State and Territories of Australia ('Non-Excludable Guarantees'). 37. Except for any liability that cannot by law be excluded, including the Non-Excludable Guarantees, the Promoter (including its respective officers, employees and agents) is not responsible for and excludes all liability (including negligence), for any personal injury; or any loss or damage (including loss of opportunity); whether direct, indirect, special or consequential, arising in any way out of: (a) any technical difficulties or equipment malfunction (whether or not under the Promoter's control); (b) any theft, unauthorised access or third party interference; (c) any entry or prize claim that is late, lost, altered, damaged or misdirected (whether or not after their receipt by the Promoter) due to any reason beyond the reasonable control of the Promoter; (d) any variation in prize value to that stated in these Terms and Conditions; (e) any tax liability incurred by a winner or Entrant; or (f) use of a prize The Promoter (including its' officers, employees and agents) excludes all liability for any loss (including, without limitation, indirect, special or consequential loss or loss of profits or opportunity), expense, damage, personal injury or death which is suffered or sustained (whether or not arising from any person's negligence) in connection with this competition including taking or using a prize, except for any liability which cannot be excluded by law (in which case that liability is limited to the minimum allowable by law), including the Non-Excludable guarantees. Any change in value of the prize occurring between the publishing date and date the prize is claimed is not the responsibility of the Promoter.